Granada FC C (SD) despatch Knockmitten Utd. Granada FC C (SD) have won 3 out of 4 home games. Knockmitten Utd has yet to win in this competition. Knockmitten Utd win against Bye. 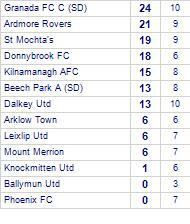 Shankill FC are defeated by Knockmitten Utd. 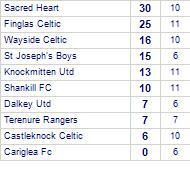 Shankill FC are currently on a losing streak of 4 games.